The Midland Railway of Western Australia was a privately owned railway that connected with the W.A.G.R. system at either end. 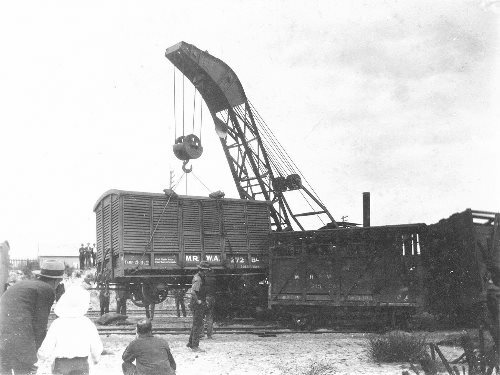 It was financed on the land grant system and was a British Company running a railway in Australia. It interchanged wagons with the W.A.G.R. and had a different livery and classification system and so M.R.W.A. wagons were instantly recognisable on the railways of Western Australia. In 1964 the M.R.W.A., after finally selling all of its land, was taken over by the W.A.G.R. Unlike the W.A.G.R. classification systems the same system was retained throughout the history of the M.R.W.A. although the wagons were renumbered in about 1910-12 and again in 1932. This can make it a bit difficult to track down exactly what happened. There was also, unlike the W.A.G.R., no separation between bogie and 4 wheeled wagons in the classification system. This did at least mean that the M.R.W.A. never ran out of letters for new types. In the early days the letter classification came after the wagon number rather than before. Photo of BL272 and CA215 taken sometime between 1914 and 1921 by H.F.L.Wehsack. Courtesy Scott Gould.